It's been some time since we have updated Aaron's blog. Young couples these days should wonder how our parents managed to care for multiple kids in the past! It's either going to cost you or take much of your effort to manage two already! Well, maybe you can argue that families with more kids have a more frugal standard of living, but I'll leave that to another post later. Our second boy has been a blessing to our family. It's hard not to compare children, but Aaron has been a easier baby to handle. It may have been the lack of using BabyPlus, lower expectations, or having experienced the first one already. The confinement period was a breeze as he ticked like clockwork - sleep, wake up, feed, poo, repeat. By the time he was two months old and for every subsequent pediatrician visit, Aaron has been breaking records in terms of physical growth. 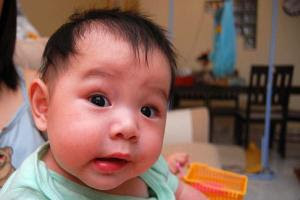 Each time we weigh him and measure his length, the pediatrician would tell us that he has broken the maxima for weight and length according to the Asian child development chart. But one thing's for sure, everyone who sees him tells us how chubby and handsome he is. I'll show you one of his best shots. At his age now, he gets curious about the world around him and pays special attention to his bigger brother. When we carry him, he prefers to face front by shifting his torso to let us know. With one arm under his bum and the other in front of his chest, it gets very difficult to carry him for long! Believe it or not, we get wrist sprains carrying this baby!